Yesterday we considered ways of praying through the music on the radio, and Chris had a great comment about how often he’s reminded both of and through music of ways to seek God, listen, and take the transformational road rather than the easy but hurtful one. Stop in to yesterday’s post and join that conversation! 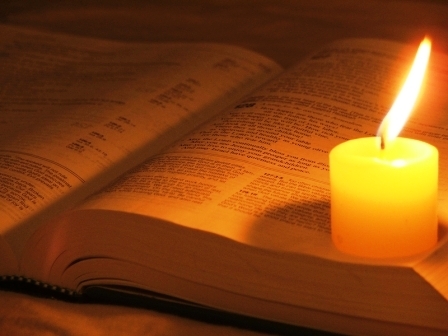 Today we’re considering the practice of sacred reading, or lectio divina. This is a practice that goes back hundreds of years, and is designed to help us really enter God’s word–and to let the word enter us too. Rather than speed reading, or reading for information, we are reading to experience God’s presence and rest in God’s heart. “We need to learn to read again if we’re going to enjoy the Bible to its fullest. Enter Lectio Divina. While the four stages of this practice were formally written by John of the Cross in the 16th century, variations on divine or spiritual reading (which is what Lectio Divina means in Latin) have popped up in writings since the time of Origen in the 3rd century. In other words, this practice has been going on way longer than speed reading. The resurgence of its use today can probably be attributed to a variety of reasons, from frustration over all the historical and literary criticism encourage in biblical reading, to countercultural desire to slow down. By reading or hearing scripture without an agenda other than to be open to the Spirit, we free ourselves up for the movement of the Spirit and the surprises she may have in store for us. The four stages of Lectio Divina are fairly simple. You read, meditate, express yourself to God, and rest in the Spirit. The passage you read should probably be a short one, no more than a few verses long. You might use part of a psalm or even just a line of Jesus’ teachings. Once you have your passage, take a few centering breaths, and then begin. Lectio (read). Read the passage slowly. Do not rush to get to the end. Take the time to read each and every word, letting each word sink down deep into your bones. Do not try to discern a meaning; don’t worry about historical or literary context. Just read. Once you’ve read the passage through, pause for a moment, and then read it again. This time, read the words and note which word or phrase speaks to you. Is there a word that bothers you, a phrase that resonates with you? Meditatio (meditate). Let your mind ruminate over your word or phrase. Do images come to mind? Stories? What about memories? Sit for a while and let the Spirit move through the word or phrase. What might she be trying to say to you? What might this word mean for you in this moment in this place? What might God be asking of you? Oratio (speak). As you come to a sense of understanding, as the meaning this passage holds for you in this moment becomes clear (or even just a bit more in focus), lift your thoughts up to God. What do you want to express? Do you have any positive or negative reactions to what you’ve heard through your reading and meditating? Whether you wish to praise or pick a fight, be honest with God. Contemplatio (contemplate). Once you’ve offered your thoughts and feelings to the divine, rest. Simply be in God’s presence for a while. Perhaps the divine voice will speak to you; perhaps you’ll just enjoy the silence. So…what do you think? Try choosing a parable (Luke 15 has some great ones) or a section of the Sermon on the Mount (Matthew 5), or a psalm (try psalm 1, 25, 42, 62 for some prayer inspiration), and read it aloud, slowly, following these steps. Do it alone or with your family, and just see what new things the Spirit is saying to you in these days! What other ways of prayer do you enjoy? What helps you connect to God, open your eyes to God’s movement in the world, or link your spirit to the Spirit? Last night at WEAVE we started off talking about some of our difficulties with prayer–does God actually change things when we pray? If not, why do we do it? That led us into a long conversation about predestination (the idea that God chooses who is saved long before we come into the picture, so we cannot earn or lose our salvation), God’s love and justice, whether justice and punishment are the same thing, and the nature of grace. I know we’ve talked about all these things before, but it’s so interesting to continue the conversation! Of course, the greatest difficulty with this conversation is that we can never know for certain who is right…God is mysterious, and we see only a little bit, through a glass dimly. So–continue the conversation here. What do you think? What does prayer do–either to God or to us? How does prayer help you, as the pray-er, or as the pray-ee? How do you deal with the mystery of God and the idea that we don’t have control over so many of these things we wish we did? At WEAVE we have been talking about, learning, and practicing prayer. For today’s after-weave…learning from the masters (the psalmists!) and bringing their form into today. One of the ways we learn to pray is by praying the words that the faithful have prayed for centuries. The Psalms are so wonderful for this, as they encompass the full breadth and depth of human experience, emotion, spirituality, and conversation with God. They offer us words for praising, confessing, thanksgiving, supplication, intercession, dedication…and they have been spoken, sung, set to instrumental music, made into art, etc, for thousands of years. Today try praying through the words of the psalmist through Psalm 19.1-4 and Psalm 29, both in word and song. John is teaching a class on Wednesday evenings right now, and the topic is prayer: what is it, what’s it for, how do we…etc. Last night the class talked about the Lord’s Prayer and what it teaches us about God and about prayer. A few highlights before we get to the really interesting part…. “Our Father, who art in heaven, hallowed be your name…” — right off the bat, we start by acknowledging God is much bigger and much holier than we are, we are but a moment, a grain of sand, in the vastness of God. And yet God knows and loves us like a perfect parent. So from the very beginning of the prayer, God is other, God is big, yet God is close. “give us this day our daily bread…” — not “give us this day our daily lobster bisque” or “give us a week’s supply of donuts” but give us this day our daily BREAD…survival food. And not enough for tomorrow, or for next year, or for retirement, but for today. Give us today what we need to live today. This is a very in-the-moment, living in the present, do-n0t-worry-about-tomorrow prayer. It calls to mind the Israelites in the wilderness, being given manna every morning but not being able to keep any for the next day–learning that God provides what we need for today, and tomorrow will bring worries of its own (as Jesus says in Matthew 6). And now the really good stuff: “lead us not into temptation…” — we talked a little about who is doing the leading and what is temptation? Why would we need to ask God not to lead us into temptation? Isn’t the point that we lead ourselves into temptation just fine, and God doesn’t want us to give in? Eventually we came around to the realization that: a) When Jesus was baptized, it says that the Spirit descended on him and then led him out into the wilderness to be tempted. So yes, God does lead people into temptation–at least Jesus, anyway; and b) the word translated “temptation” in Aramaic is a word that means “diverted from true purpose” or “whipped about like a flag in the wind” or “focus on the flashy rather than the real” or some such idea. So in many ways, that squares with the kinds of temptations Jesus experienced in the wilderness–to perform and to get glory for himself rather than to follow the path that points always to God and God’s purpose. This led to an interesting discussion of what prayer is for–should we be asking God to do all these things, or should we be allowing ourselves to be the answer to prayer? In other words, the difference between a child asking a parent to do something for them vs asking for help using the skills they already have to figure out the next thing. Sort of a “do this please” compared to “can you help me do it.” When do we ask God for direct intervention, and when do we ask God to make us an answer to the prayers of others? And when do we just go and do it, rather than asking God anything at all? No one came up with an answer to these questions…and, of course, they lead to further questions that relate to the book almost Christian (which we’re discussing on Wednesdays). if the purpose of prayer is not for us to talk to God, but to learn to use the skills we’ve already been given, then why involve God at all? Can’t we do that without ever spending time with God? What do you think? How do you pray? What parts of the Lord’s Prayer really resonate with you? Which parts are hard? Do you skip any words when you say it? Do you find yourself repeating any of it to yourself? What is prayer for?